I stumbled across this set when I was looking for something else (sometimes days are like that) and I realized I’d drawn it year ago and never posted it. So, here the set is in all it’s glory. It’s one of those set’s I’m not overly pleased with, but I’m glad to finally share it, even if its a bit late. Sometimes I scan things and sort of forget about them in the depths of my harddrive. I like to think that sometimes it’s okay for paper dolls to age like a fine wine. Since I have plans tonight and plans on Saturday, this is a short little post. I hope everyone enjoys the paper doll and I’ll be back next week for more. In June though, I should mention, I’ll be taking a break for a few weeks, possibly the whole month for travel and some work things. 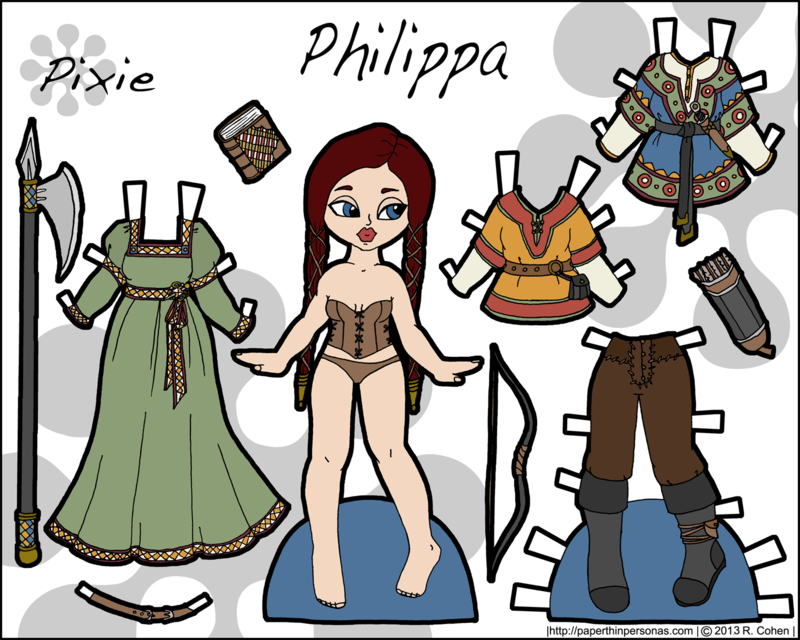 Another fantasy Medieval sort of Pixie Paper Doll for the this week. I have been on this fantasy Pixie kick for a while… I have one more of a similar style to post and then I shall have finished my flight of fancy in this direction until I get distracted and decide to turn to something else. She is named for Philippa of Hainault who was the Queen consort of King Edward III of England in the 14th century. Philippa of Hainault is buried in Westminster Cathedral, so you can go visit her there should you be in London and feel like it. Westminster is pretty darn cool, I have to confess. So, the response to the new lips on the Pixies has been uniformly negative. 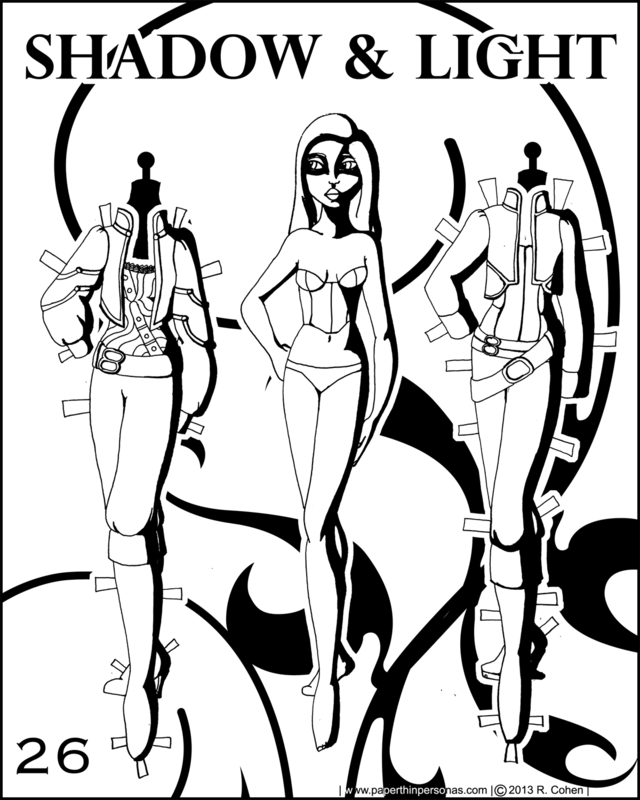 I tend to agree with the concerns leveled by my readers and therefore won’t be continuing in the style after this paper doll set. 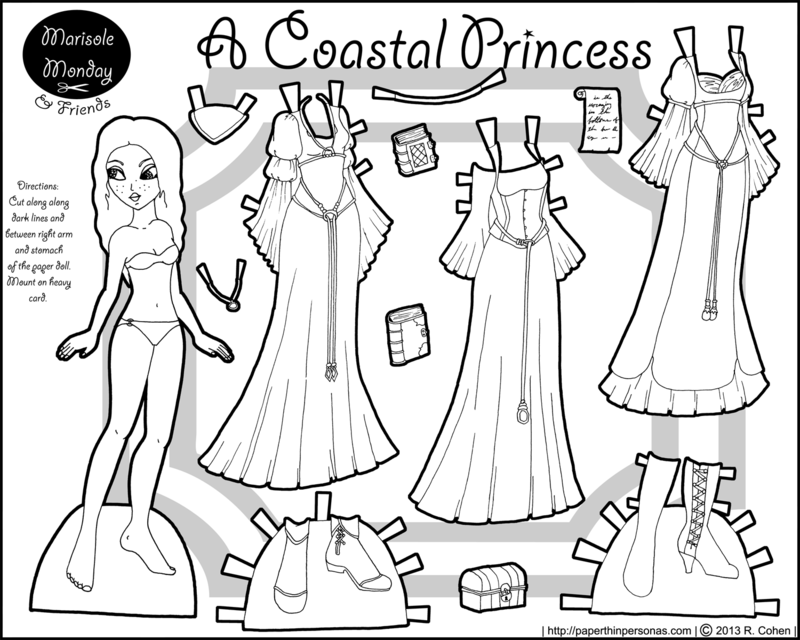 Every paper doll I do is a little different. 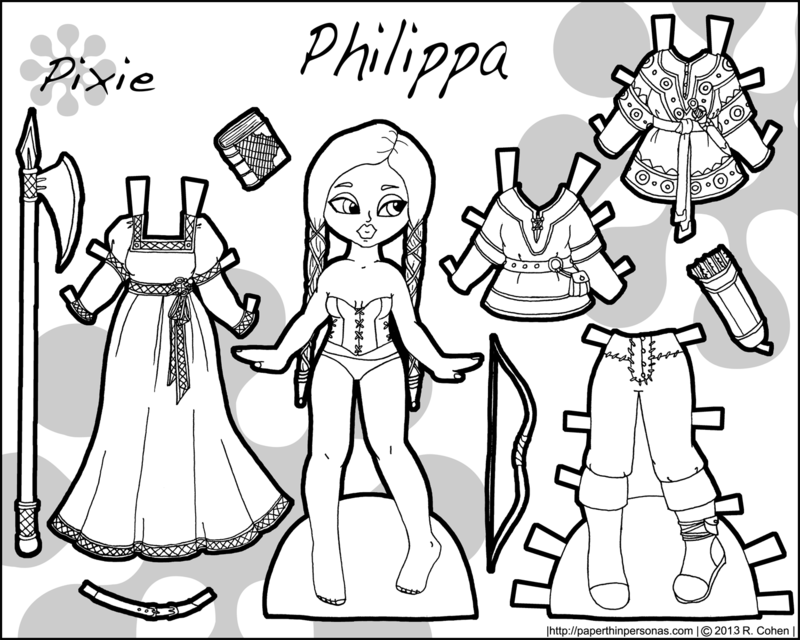 Today’s Pixie Paper Doll has a few things that are different from normal. I’ve been experimenting with how I draw the Pixie faces, so you might notice her lips are distinctly different from the other Pixies. I’m not sure how I feel about this new style, I think I’ll stick with it for the next few (since I already have their heads drawn this way) and see how I feel. Feedback, as always, is enjoyed and very useful. And, debates of the spelling of Medieval aside, I was intrigued. What was a Medieval outdoors commando? I wondered and how would one dress, anyway? 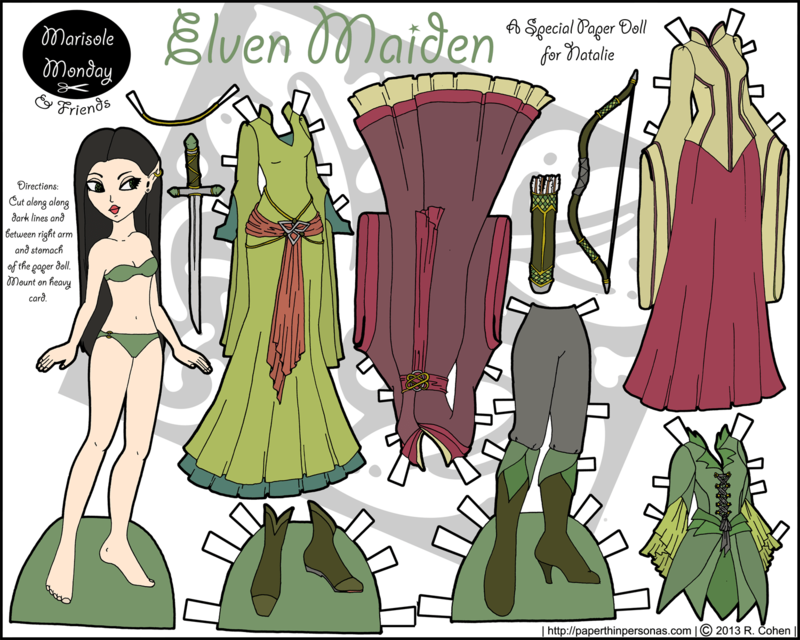 And so, mostly to forefill my own fascination at the concept, I drew this Pixie set. Free advice to people who make requests, the weirder the request, the more likely I am to take it on. A couple things that are different about this Pixie than what was asked for. I did not give the doll blue eyes (mostly because I forgot) and the set is only medieval in the vaguest of senses. Still, I think she came out pretty cute. I do rather wish I’d remembered to give her blue eyes, per Megan’s request, so I hope she will forgive me that oversight. Robynn is named for Robin Hood, of course, who robbed from the rich, gave to the poor and was generally a cool dude, though did not, necessarily exist. I had a great love of Robin Hood stories when I was a child.